Surgical management of partial thickness tears remains controversial a wide range of options exist, from conservative therapy to open rotator cuff debridement and repair. Prior to arthroscopic surgery, excision and repair of significant partial-cuff tears was common. However, since the advent of arthroscopic techniques, recommendations for the operative management of partial tears vary between investigators. Essentially, there are three surgical options debridement alone, decompression and debridement, and excision of damaged tendon with primary repair. The CHL passes over the top of the shoulder and fans out laterally before joining the shoulder capsule. A small segment of the CHL blends with the rotator cuff attachments as it attaches to the anterior aspect of the greater humeral tuberosity. A larger segment extends posteriorly through the joint capsule (beneath the infraspinatus and over the bicep tendons) to attach to the lesser tuberosity of the humerus. By attaching on either side of the bicipital groove, the CHL provides a tunnel for the biceps tendon. Renditions of the CHL in the various layers of the rotator interval are shown in Fig. 3 (20,26, 28,31,32). 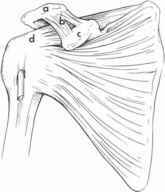 The coracoacromial ligament (CAL) is a trapezoidal shaped ligament twisted into a helix between the coracoid and acromion (13). As shown in Fig. 2, the CAL courses an oblique pattern over the rotator cuff and shoulder capsule, with which it has a close spatial relationship (4). In fetal development, the CAL is visible by 13-wk gestation as a band that is continuous with the acromion's undersurface. By 36-wk gestation, fibers of the CAL are well organized (14). The knee is clearly the main focus for work on ligaments owing to the frequency of ligament injuries at the knee from both sport and other accidental trauma with the disability caused by knee joint instability. Although there are numerous other sites around the body that have clinical applications for this technology, the knee, and particularly the cruciate ligaments, drive the subject forward. This chapter considers the reconstruction of tissues other than ligaments that are primarily collagenous, such as tendon and capsular tissues, as the applications are similar and often have research studies relevant to ligaments. Of the other sites, the rotator cuff is probably the structure affected most frequently and causes sufficient disability for surgery to be considered. However, this disability arises as a result of degenerative changes in the tissues of an older patient population thus, factors such as healing responses may be different. Tears of the rotator cuff typically involve the supraspinatus tendon, and they will often include the posterior cuff to a variable degree. The subscapularis tendon, although less frequently involved, may be easily overlooked if not considered during diagnostic evaluation. The torn rotator cuff can demonstrate variably shaped defects that should be noted with surgical reconstruction. A vertical tear, in line with the course of the tendon, can often be repaired with a side-to-side closure. Horizontal tears run transverse to the normal course of the tendon and demonstrate variability in size and the extent of retraction. 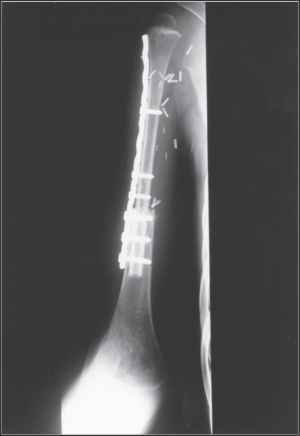 Typically, closure of such defects requires a transosseous repair to the greater tuberosity. Complex tears that contain both horizontal and vertical components also occur and may require a combination of the techniques. 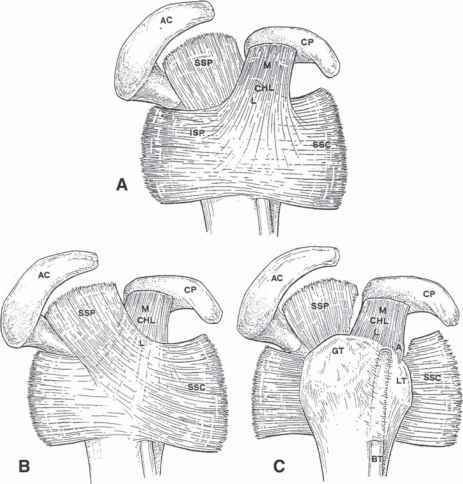 The stability of the shoulder depends on appropriate soft tissue reconstruction. Note the strip of biceps femoris tendon which is usually anchored to the glenoid in order to improve the stability of the joint. 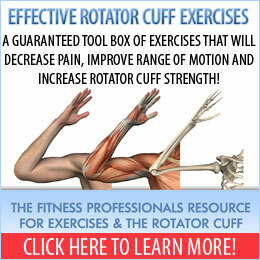 The rotator cuff is sutured contouring the fibular epiphysis. The soft tissue repair around the transferred epiphysis is complicated by the potential danger for the epiphyseal vascular network related to direct reinsertion on the bone of the rotator cuff and deltoid. For this reason the muscles are just sutured around the fibular head and the strip of biceps femoris tendon is anchored to the glenoid achieving acceptable stability (Fig. 10D.4). In some cases, however, a proximal displacement of the physis does occur due to anatomical discrepancy and insufficient stabilization. 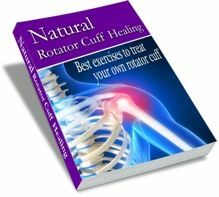 Rotator Cuff Injury Recovery Kit is not for free and currently there is no free download offered by the author.